The clock above the locked door is just 11 minutes short of the hour we’ve been allotted to find a mysterious treasure and escape from our host’s Mardi Gras study, and my smarty-pants krewe is starting to sweat it. Our collective brain power has been sorely tested by the deviously clever puzzles designed by Andrew Preble and Michelle Calabro, the masterminds behind the interactive game Escape My Room, which opened on June 17 in a Loyola Avenue office tower and has been booked pretty solidly ever since. Mrs. DeLaporte’s helpful hint, delivered via intercom by a “social secretary” who’s watching us on hidden cameras, does the trick with those pesky pink gators. But our joy in unlocking the latest in a series of padlocks and hidden compartments is short-lived. It merely leads to another and another conundrum, puzzle after interlocking puzzle, like Russian nesting dolls. Will we succeed in beating the clock? Spoiler alert: we do not. Bummer! But my highly competitive friends and I, who excel in many cerebral pursuits, can take comfort in the fact that we are not alone. A full 70% of the groups who attempt the escape fail to make it out of the study. And even in defeat, we can genuinely say that we had a jolly good time. The fun begins on arrival at a partially vacant 1960s-era federal office building at 701 Loyola Avenue, where the CIA is rumored to occupy the 14th floor. Security buzzes us up to the 4th floor, where we proceed down an eerily empty institutional hallway. A single orange vinyl chair sits outside a door marked Escape My Room, and once we open that door we enter a whole other world. Dimly lit by a low-hanging chandelier of swans, the shabby-chic parlor is a Dr. Caligari’s cabinet of oddities. 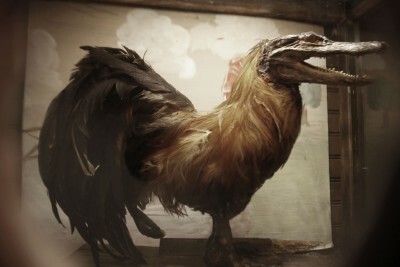 Victorian dolls are juxtaposed with strange taxidermical creatures: a feathered rooster topped by an alligator head is displayed in one glass case, while another features a spooky stuffed iguana with a human skull. Andrew Preble didn’t have to search far and wide for these freaks of nature. His Dad, folk artist John Preble, runs the Abita Mystery House and UCM Museum in Abita Springs, which supplied many of the props in the parlor and the Mardi Gras study in which we’re about to be imprisoned. Before we go into lockdown, Preble gives us a brief history lesson. Born as digital games that challenged players to escape from virtual rooms, escape rooms quickly morphed into brick-and-mortar games now found in many cities worldwide. New Orleans, a city of secrets if ever there was one, makes an especially intriguing setting, as we’re about to discover. First, we must sign legal waivers and surrender our bags and cellphones to Mrs. DeLaporte’s social secretary (charmingly portrayed by Lauren Delaney George), who stashes our stuff in a locker and lays down some ground rules: The game requires brains, not brawn, so don’t try to force anything to open. Armed with nothing but clipboards and pencils, we enter an inner sanctum furnished with 19th and early 20th century antiques and collectibles from around the globe. Amid the old books, knick-knacks, souvenirs, baskets, chests and decorative vases is a trove of Carnival memorabilia dating back to the origins of Comus, some (but not all) of which is central to solving the mystery. Hunting and gathering is integral to the game, as is decoding the meaning of letters and numbers hidden in all kinds of nooks and crannies (the clipboard comes in handy for that). Messages written in haste by a missing DeLaporte daughter also come into play, adding to the drama of an unfolding storyline. Every detail of the installation is exquisitely curated, from the stereoscopic view cards to the vintage Carnival goblets to the rolltop desk, making it an interactive museum that’s worth the price of admission in itself, even if you fail to escape. Escape is the name of the game, of course. Fortunately, my close-but-no-cigar krewe will get a chance to redeem ourselves. Preble has rented out the entire 4th floor and, beginning this fall, plans to start adding additional escape rooms with their own backstories and stage sets. We shall return! And we won’t rest easy until our group photo joins the wall of winners proudly bearing a sign that proclaims their victory: We Escaped! Escape My Room, 701 Loyola Avenue, is open 7 days a week and accommodates groups of up to 7 people at $28 per person. Visit EscapeMyRoom.com for more information, and to book a one-hour time slot.